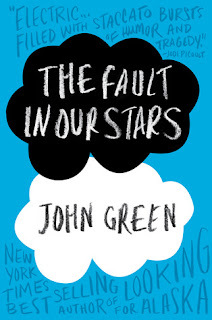 The majority of the YA/contemporary book blogging world is afflicted with a condition known as "John Green-itis." Once you've caught it, you feel a variety of symptoms such as breaking out in hysterical laughter, delving into deep thought, over the simplest sentence he's written, and crying until you actually feel as if you are empty inside and will never live again. Until recently, I'd avoided this epidemic. However, when I saw a shiny copy of The Fault in Our Stars staring at me from the library shelves, I gave into temptation. I've caught a bad case of John Green-itis. The Fault in Our Stars is Hazel and Gus's story of how they met, fell in love, and lost everything. They are young cancer survivors who meet suddenly at a support group. They aren't your typical teenagers, both physically and mentally, which makes them the perfect fit for each other. This isn't a book on how the character is learning to adjust to cancer or the aftermath; they've already been through that. This is a love story and cancer is just a side-story. I loved each and every character; I felt as if they were all there for a specific purpose and no one was superfluous. Of course, our main characters are the best. Hazel and Gus are so intuitive, quirky, and complex. I saw another reviewer of the book say "We need more Augustus Waters in this world" and nothing could be more accurate. I realize that this is a pretty terrible review, but honestly, no words could do it justice. This is one of the most quotable books I've ever come across. There are such deeply profound thoughts, as well as sentences that are just plain hilarious. If the copy I'd been reading wasn't from the library, I would've highlighted the hell out of it. In conclusion, if you haven't read this book or anything else by John Green, DO IT, and if you have, what would be another book of his that you would recommend reading next? This is next in my TBR list, shortly followed by Looking For Alaska ... and then Will Grayson, Will Grayson. Simply because I know I will catch John Green-itis! I loved this book too! Just wanted to point out this sentence: "I saw another reviewer of the book say 'We need more Augustus Waters in this world' and nothing could be farther from the truth." I think you meant nothing could be closer (not farther) from the truth. That you would like more Augustuses in the world, right? Just thought I'd point that out! haha wow, thank you for pointing that out! I fixed it. I really loved Paper Towns - as much as I loved The Fault In Our Stars. John Green has such an interest in exploring new topics and introducing new concepts. I love it. I've never read his books, now I do! Unfortunately there are about 50 holds on the copy at the local library. Looking for Alaska is my fave by him, followed by Paper Towns. Looking for Alaska is the next of his on my TBR list! Amen!! My review of this novel is just like this - a simple rave for the book. 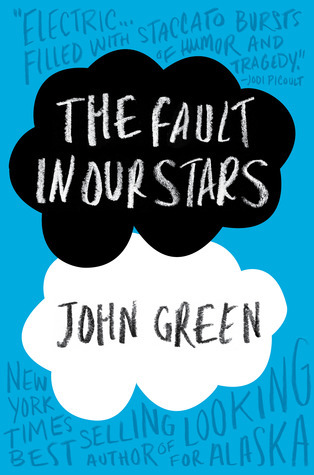 The critiques I've read, seriously - they exist, focus mostly on how Gus and Hazel don't talk like real teenagers. I disagree, but I think your point is even more compelling - they aren't your typical teens. That's the point. Welcome to the John Green fan club! I actually feel the need to go buy myself my own copy now, just so I can have it. It was a great reading experience! This is avery powerful book. I thought it was amazing. I'm not usually one for really sad books, but I had to read this one, and I'm glad I did. I'm not sure I'm inflicted with "John Green-itis" though. I do love vlogborthers, though. I have seen nearly every (over 1000) videos! I loved this book so much, so I totally understand your feelings. I am not a YA fan but this book continues to say READ ME and the fabulous reviews have made me add it to my list. I actually did a Top Ten books I must read before end of year and this was one of them. I've never read John Green, so I need to go out and get one of his books pronto. I AM SO HAPPY THAT YOU HAVE BEEN INFECTED!! Omg! But you already know my love for John Green. Surprisingly I have not yet read this one. I need to be ready for it. I think soon I shall though. I do own it.